Exit at Cloverfield Boulevard (north) to Santa Monica Boulevard. Turn left (west) on Santa Monica Boulevard. Turn right (north) on 16th Street to 1250 16th Street. Valet parking is available at our main entrance, and parking garages are located on 15th and 16th Streets. Connect with the 10 Freeway West and follow the directions above or exit Wilshire Boulevard West (from the San Fernando Valley), merge onto Wilshire Boulevard. Turn left (south) on 16th Street to 1250 16th Street. Valet parking is available at our main entrance, and parking garages are located on 15th and 16th Streets. Valet Service -- 1250 16th Street; Weekdays on a 24-hour basis. Daily valet parking is $12.00. 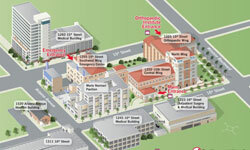 1260 15th St. Medical Building -- Weekdays: 6:30 am to 10 pm; Saturdays: 8 am to 6 pm. Rates posted at entrance. 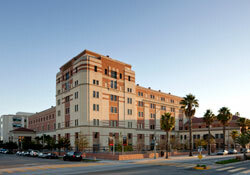 1245 16th St. Medical Building -- Weekdays: 6 am to 10 pm; Saturdays: 8 am to 5 pm. Rates posted at entrance. 1311 16th St. Structure -- Weekdays: 6:30 pm to 6 am; Weekends, Holidays: All day. Access tokens available for $5 at our main Security desk at 1250 16th St.
Metered street parking -- Please carefully read street signs. Meters in effect every day except Sunday. Monthly Parking Pass -- $71.00/ month includes in/out privileges. Weekly Parking Permit -- $25.00 per/ week includes in/out privileges. Labor/ Delivery Day Pass -- $5.00 per/day includes in/out privileges. After-Hours -- $5.00 from 6:30 pm to 6:00 am. For additional parking information, please click here.